When the original Baxi Bermuda back boiler unit (BBU) was launched in 1966, it was so practical and reliable that over 80% of the market was a Baxi installation. The name quickly became synonymous with back boiler expertise. Since Part L of the Building Regulations changed in 2005, replacing old BBUs has become a complicated and expensive business. Boilers have to be re-sited, pipes re-routed and whole walls redecorated. The innovative new condensing Bermuda BBU HE from Baxi is the most efficient way to replace a back boiler. It complies with current legislation and is the only high efficiency BBU on the market to serve as a direct replacement. Combine this with attractive, reliable and highly efficient fires from Valor, a BDR Thermea company, and you've got the whole package. 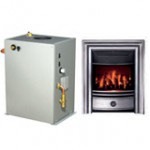 A convenient, one-supplier solution offering complete start to finish boiler and fire installation. Replacing one back boiler with another has obvious advantages, the main one being that the existing pipework can be utilised. This allows the entire system, including the fire, to be replaced in a single day, causing minimal disruption to tenants. And because it has SEDBUK Band A-rated efficiency, it also means reduced energy bills too. The fully-sealed, one-piece flue allows for easy installation with no joints to inspect within the chimney. The electrical fire front offers easy access to the boiler controls and with LED illumination technology, the fire effect-only mode costs less than £6 per year to run.